Masterson was born in Manhattan, the daughter of writer-director-actor-producer Peter Masterson and singer-actress Carlin Glynn. She has two siblings: Peter Jr., and Alexandra. As a teen, she attended Stagedoor Manor Performing Arts Training Center in upstate New York with actors Robert Downey Jr. and Jon Cryer. Later, she attended schools in New York, including eight months studying anthropology at New York University. Masterson's first film appearance was in The Stepford Wives (1975) at the age of eight, playing a daughter to her real-life father. Rather than continue her career as a child actor, she chose to continue her studies, although she did appear in several productions at the Dalton School. In 1985, she returned to cinema in Heaven Help Us as Danni, a courageous teen running the soda shop of her gravely depressed Dad. She appeared with Sean Penn and Christopher Walken in the film At Close Range (1986) as Brad Jr's girlfriend Terry, a film based on an actual rural Pennsylvania crime family led by Bruce Johnston, Sr. during the 1960s and 1970s. She later starred as the tomboyish drummer Watts in the teenage drama Some Kind of Wonderful (1987). As a result, she is loosely connected with the Brat Pack. The same year Francis Ford Coppola cast her in Gardens of Stone in which she acted with her parents, hired by Coppola to play her on-screen parents. In 1989, she played in Chances Are alongside Cybill Shepherd, Ryan O'Neal and Robert Downey Jr., and she starred as Lucy Moore, a teenage girl giving up her first baby to a wealthy couple, played by Glenn Close and James Woods in Immediate Family. For her work in that film she received a "Best Supporting Actress" award from the National Board of Review of Motion Pictures. Masterson continued acting in both films and television during the 1990s. In 1991, she starred in Fried Green Tomatoes, a film based on the novel Fried Green Tomatoes at the Whistle Stop Cafe. The film was well-received, with film critic Roger Ebert applauding Masterson's work. The following year she was invited to host Saturday Night Live. In 1993, she played opposite Johnny Depp in Benny & Joon as Joon, his mentally ill love interest. In 1994, she acted in Bad Girls, playing Anita Crown, a former prostitute, who joins with three other former prostitutes (played by Madeleine Stowe, Andie MacDowell and Drew Barrymore) in traveling the Old West. In 1996, Masterson acted alongside Christian Slater in the romantic drama Bed of Roses. Although Masterson carried on her work in the film industry, by 2000 she had made a move towards television. In 2001, she produced her own television series, Kate Brasher, which was canceled by CBS after six episodes. In 2004, Masterson starred in the Emmy and Peabody Award-winning HBO biographical drama Something the Lord Made. Between 2004 and 2007, she made five guest starring appearances on Law & Order: Special Victims Unit as Dr. Rebecca Hendrix. A decade later, she appeared in a recurring role as FBI director Eleanor Hirst in the second and third seasons of Blindspot. Masterson has appeared in Broadway theatre productions, and was nominated for a 2003 Tony Award as "Best Featured Actress in a Musical" in the Maury Yeston musical Nine: The Musical, directed by David Leveaux. Masterson has narrated several audiobooks, including I See You Everywhere by Julia Glass, Book of the Dead by Patricia Cornwell, The Quickie by James Patterson and Look Again by Lisa Scottoline. By May 1993, Masterson revealed she had written a screenplay for a film tentatively entitled Around the Block, a romantic comedy about a "woman who conquers her fears by becoming a singer"; in a cover story about Benny & Joon's box office success, she told Entertainment Weekly she was going to direct it herself, with principal photography expected that autumn. In 2001, she began her directing career with a segment titled "The Other Side" in the television movie On the Edge. Masterson made her feature film directorial debut in 2007, with The Cake Eaters, which premiered at the Ft. Lauderdale International Film Festival as well as the Ashland Independent Film Festival where it received the 'Audience Award – Dramatic Feature' prize in 2008. Of her move to directing, Masterson said in an interview, "When I signed to do this, I wasn't scared but, yes, it was scary. I'm already 40, although we don't want to talk about that. In '92, I wrote my first screenplay, which I then was to direct, but I ended up taking an acting job because it takes forever to get a movie made." Masterson was married to filmmaker Damon Santostefano from 2000 to 2004. In 2006, Masterson married actor Jeremy Davidson (born Jeremy Michael Greenberg) after they starred together in the 2004 stage production of Cat on a Hot Tin Roof. Masterson gave birth to their first child, a son named Phineas Bee Greenberg, on October 11, 2009. She gave birth to twins in August 2011, son Wilder Greenberg and daughter Clio Greenberg. ^ Mary Stuart Masterson profile, The New York Times; accessed May 20, 2014. ^ Jamie Currie. "Possibly Pack". thebratpacksite.com. Retrieved July 31, 2015. ^ "Yahoo TV". yahoo.com. Retrieved July 31, 2015. ^ Roger Ebert (January 10, 1992). "Fried Green Tomatoes". suntimes.com. Retrieved July 31, 2015. ^ "The 2003 Tony Award nominations". latimes. May 13, 2003. Retrieved July 31, 2015. ^ "Movies directed by Mary Stuart Masterson". IMDb. Retrieved 2018-08-07. ^ Joyce Eng (November 3, 2009). "Mary Stuart Masterson Welcomes a Son". TV Guide. ^ Michael Nassberg. "Local filmmaker to screen his film, "Tickling Leo," Nov. 22". The Reporter Group. ^ "Breaking Celeb News, Entertainment News, and Celebrity Gossip". E! Online. Retrieved July 31, 2015. 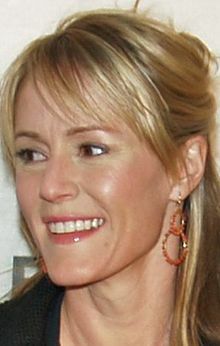 Wikimedia Commons has media related to Mary Stuart Masterson.